St James Church is located down the lane to the left of the eagle gateway. Behind the church you'll find the wonderful Fletcher Moss Gardens, with its exotic plants, flowers, rock gardens and ponds. Upmarket residential developments to the left and the right mark this area out as a desirable place to live. 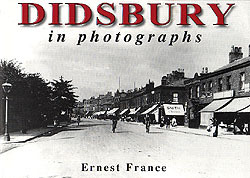 Didsbury preserves much of its village character, with shop facades dating from Victorian times and before. Behind to the left are pleasant streets of small but now highly sought after terraced houses. Along Dene Road are typically British 1930's semi detached houses. Off to the east of Didsbury village, is a new development of homes in a decidedly un-modern style. In the last decade of the 20th century, architects have looked to the latter part of the 19th century for inspiration. These houses have all the character of the past with the advantages of present day mod-cons. At the traffic lights, Wilmslow Road meets Barlow Moor Road to the left and School Lane to the right. Didsbury library is situated between Wilmslow Road and Barlow Moor Road, and was built in 1924 with a grant from Andrew Carnegie. With its gothic-syle entrance and octagonal tower, it appears a temple to books and learning. Like most libraries it has a good selection of local interest books and pamphlets. It's open every day except Wednesday and Sunday. Opposite the library, is a set of new restaurants and bars, part of the "cafe bar revolution" that's taking over Manchester, at least its more fashionable areas. At night this part of Didsbury gets very busy and noisy, especially at pub closing time (which we may not have to endure for much longer, if proposed government legislation is successful). If you keep going along Wilmslow Road, crossing the Fog Lane Lapwing Lane traffic lights you'll get to Withington and eventually the city centre. On New Years Day 2000, it was foggy on Fog Lane - this is a photo I'd been waiting to take for a long time! From Didsbury village, let's continue north west along Barlow Moor Road, hearing into West Didsbury. Like many a "moor" in local place names, it's long since been covered over by roads and houses. The junction of Barlow Moor Road and Palatine Road is another key intersection in south Manchester - all around us are large Victorian Houses, trees and gardens. This area preserves a very strong aura of the late 19th century, when the newly opened railway line made it possible for prosperous Manchester merchants and their families to come and live here. On Palatine Road, south of Barlow Moor Road, you'll find the little-known Marie Louise Gardens, donated by Johann Georg Silkenstadt, and named in memory of his daughter Marie-Louise, who died in 1891 aged 26. Palatine Road was so named as it leads across the River Mersey into the former Palatinate of Cheshire, though by the early 20th century, this part of the county had been annexed by the City of Manchester. Schools, colleges, universities, research institutes, hospitals, and the people who work in them, are a key to the character of Didsbury, both now and in the past - Withington and Christie hospitals are close by, Fielden Park Centre, where I used to teach German, French and English as a Foreign Language, is on Barlow Moor Road near the bottom of Burton Rd, Manchester University, MMU and UMIST are a bus ride into town, so this area is a popular student residential area. Along Barlow Moor Road to the right are the trio of Old Lansdowne Road, Clyde Road and Northen Grove. This is quintessential bedsitter land, an area much appreciated by both students and ex-students - have you got any memories of here? This would be a good setting, I think, for a book entitled "Didsbury Stories". Clyde Road and Old Lansdowne Road lead to Lapwing Lane and Palatine Road, but the top of Northen Grove turns sharply to the left, leading to Burton Road, the main shopping street in West Didsbury. There are empty shop units at the bottom end of Burton Road, near the corner, while further up, boutiques cater for the young and affluent, who socialise, I'm told, at the Metropolitan, formerly the Midland pub. To the west of Burton Road is Withington Hospital - now demoted in status - but continuing as a community hospital. Next to Withington Hospital you'll find Siemens, whose Bauhaus-style building is one of my favourite examples of modern architecture in Manchester. To the south of Barlow Moor Road, you can walk down to the Mersey, which, enclosed by high flood banks, meanders its way westwards from Stockport to Liverpool. West Didsbury ends at Princess Road dual carriageway (A5103), like Kingsway, an important piece of 1920's city planning, now the main road south out of the city. Across the traffic lights is Southern Cemetery and Chorlton, which I'll be visiting soon. The roads are leafy, there are lots of trees, the houses are either big and Victorian, or small and cosy - you might live in a plush modern apartment, or maybe a tiny bedsit - there's a lingering character of the past, mixed with a strong sense of the present and the future; it's bohemian, it's cosmopolitan, maybe a bit pretentious; some bits are glamorous, other bits are run-down, but whether East, West or central, it's all Didsbury - one of Manchester's best-known and - by many at least - best-loved suburbs.